Caregivers are always stressed for time, so eating healthy is an extra challenge, because let’s face it, preparing fresh foods takes more prep time. But eating healthy becomes that much more critical when our lives are stressed. So, here are a few suggestions on tools and tricks that will help make it easier to prepare healthy foods. Yes, they’re easy, and as a caregiver, it seems like the quickest way to put a meal on the table. But they’re expensive, and they have added ingredients that diminish their healthy properties. Try some of these other tricks instead. When I make rice or soup, I make an extra-large batch freeze some for a day when I need to throw something together quickly. I do the same when I make Yonana frozen fruit “ice cream.” I make at least a double batch and freeze servings for another day. When I clean carrots, I clean and cut them all. Then I have a healthy snack at my fingertips. Or I prepared carrots (or celery, or other veggie) ready to be cut for other meals. Caregivers can create single or double serving packages to take to their loved one. Cooking chicken breasts for dinner? Cut and season and bag up additional breasts to be pulled out and used for quicker prep the next time (either cooked or uncooked). This may not seem like a big time saver, but small frozen pieces will defrost quicker, and having them already seasoned makes it easy to throw it in a pan another day. Use you’re time in the kitchen to make additional items that you can use later, such as eggs. Make a batch of hard boiled eggs. Roast some root vegetables. Cook that batch of rice for another day. I buy a container of grape tomatoes, wash the whole container, then leave them in a bowl for when I need to stave off the hunger. I wash the whole bag of green beans, or snap peas, or other munch-on vegetables. 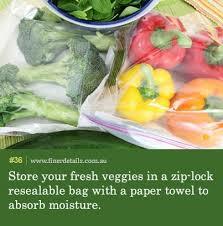 To keep the vegetables from spoiling, I bag them up with paper towels and squeeze out the air. Stock your freezer with frozen vegetables, from individually packed veggies to mixed stir-fry type veggies for quick meals. They are said to have the vitamins and mineral preserved in the process and are easy to add to any dish. I don’t like waste, but that includes time, therefore I must advocate the use of it to keep your baking pan clean. For example, when baking or broiling, if you line the pan with foil, chances are you won’t have to wash the pan after the meal is served. And most times, you can use the foil for storage. When you discover a quick and easy meal and find it works for you, print a copy or write it down and put it in a book (physically or digitally) for future reference. Caregivers can create a section for recipes their loved one particularly enjoys, or if their diet is restricted, alternative ways to prepare favorite foods. 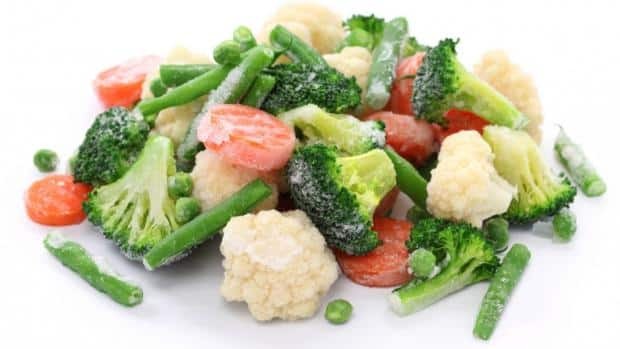 All that food prep can add water to your fruits and vegetables and make them go bad quickly. Dry them as much as possible, and put them in a baggie with paper towels, then push out as much air as possible. You’ll be amazed how long the food lasts this way. 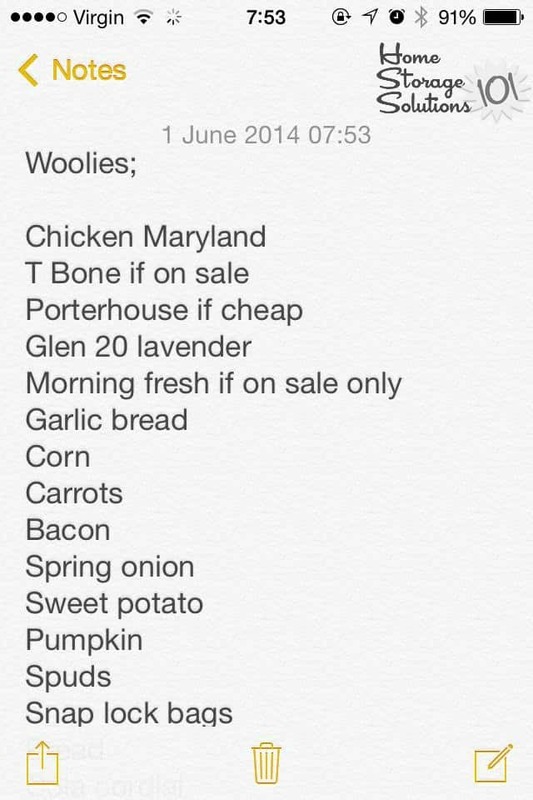 I used to keep a list on the side of my microwave to take to the store when it was time to grocery shop. Then I’d find myself calling home for someone to read the list to me. I finally started keeping a running list in my phone. 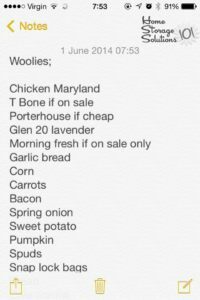 Then, whenever I stopped at the store, I had the list. This has made my time so much more efficient. Caregivers can start a separate list for your loved one. Add items to this list while at your loved one’s house. Then it will be easier to have that list with you when you go to the store. AND, to save time after meals, use a Cravaat Dining Scarf adult bib to protect clothes from food spills and avoid the need to excessive laundering. This all may sound easier said than done, but try one or two. You’ll find out how beneficial they are, especially for caregivers. Eventually, you’ll find yourself utilizing more of these tricks. Anything to make life easier is worth a try. 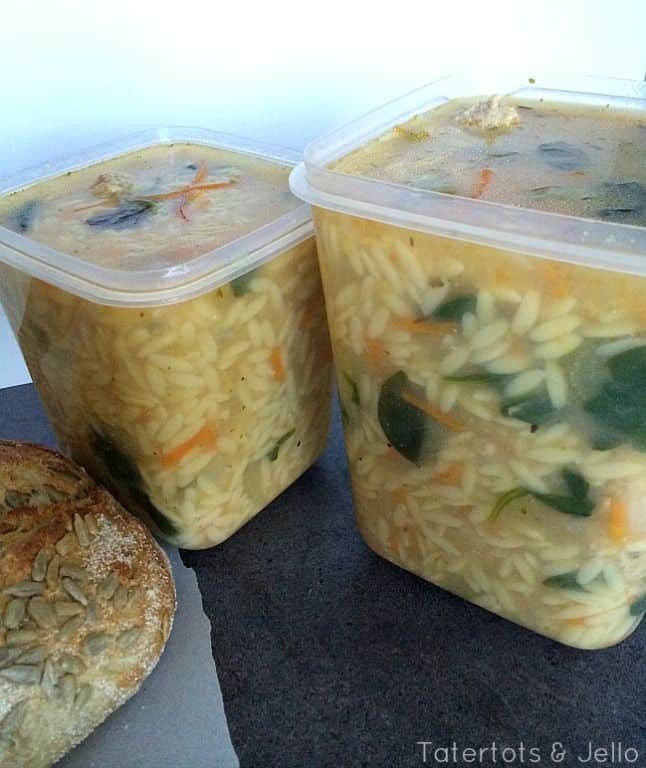 If you have any tricks you use to streamline meal prep, please share.